Euronews | Bryan Carter: In the wake of the murder of government critic Jamal Khashoggi by Saudi Arabia, several member-states across the European Union are reassessing their economic ties with the kingdom. Though oil has historically played an important role between the West and Riyadh, often overriding other considerations such as human rights violations to the absence of democratic representation, Saudi Arabia has also become a major weapons purchaser, pouring millions into the coffers of arms manufacturers. In the period between 2013 and 2017, the country increased its imports of weapons by 225% compared to 2008-2012, making it the world’s second-biggest arms importer after India, according to the Stockholm International Peace Research Institute. This buying spree is not only fueled by the war in Yemen (which, according to some estimates, has already caused the death of at least 50,000 people and starved more than 8 million) but also because of Saudi Arabia’s quest for dominance in the Middle East, which it carries out with the blessing of the United States and other major powers eager to counter the influence of Iran. But while the United States and European countries have so far been quite muted in their criticism of the Saudi regime and crown prince Mohammed Bin Salman, the gory details of the prominent journalist’s murder, inside a consulate, not far away from Europe’s borders, may have been a “bridge too far” according Marc Pierini, a former EU ambassador turned visiting scholar at Carnegie Europe. On Saturday, the EU’s chief diplomat Federica Mogherini issued a statement in which she calls on the “need for (a) continued thorough, credible and transparent investigation”, and says the circumstances around Khashoggi’s death are “deeply troubling”. 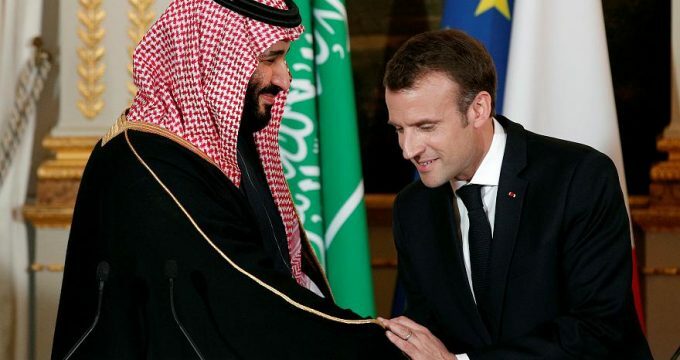 However, in the absence of EU-wide sanctions, member-states can still unilaterally decide to eventually suspend further arms exports to Saudi Arabia – a step taken by Germany, following a joint statement with France and Britain, in which the three allies asked “for the investigation to be carried out thoroughly until responsibilities are clearly established and that there is proper accountability and due process for any crimes committed”. But according to Pierini, France, Britain and the UK are “precisely those selling most weapons to Saudi Arabia. This will probably continue. I don’t see unanimity on sanctions of that kind, but I see unanimity on condemnation and on putting a certain distance with some of the political actors in Saudi Arabia”. Willy Borsus, the president of the Walloon Region, recently said he would consider banning arms exports to Saudi Arabia, but called on Belgium’s foreign affairs minister Didier Reynders to seek an EU-wide answer to the Khashoggi case, arguing that Belgium alone will not exert any influence over Riyadh. Phillipe Hensmans, director of Amnesty International in Belgium, rejects that argument. Hensmans believes that the labour and economic incentive behind arms exports to controversial regimes should not tread on ethical considerations, and urges arms companies like FN-Herstal to diversify their clientele. While it is still too early to see the full consequences of the Khashoggi murder, Pierini believes this case provides a test for EU diplomacy. “We [the EU] have a big diplomatic apparatus but when it comes to serious business, like Libya, Syria, this case, it’s only the bigger member states. “So whether they want to act together will be a sign of the force they want to apply,” Pierini added. * Despite Euronews’ requests, FN-Herstal did not comment in time for the publication of this article.